Spin the reels for a chance at a very tasty treat indeed. Click here to play! This classic 3 reel game will have you spinning in plenty of delicious symbols to amass your slots fortune! As the title of the game suggests, you’ll be spinning in fruit salad. 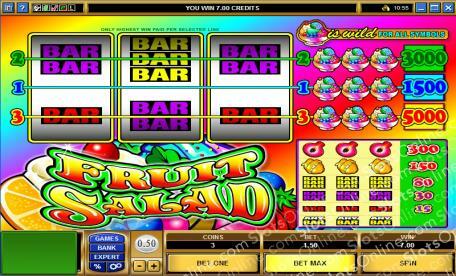 If you can manage to collect three bowls of tasty fruit across the first payline, you’ll get up to 1500 coins. Three bowls across the second payline and you’ll get 3000 coins. Finally, three bowls across the third payline will get you the maximum payout of 5000 coins. This mouth-watering symbol is also a wild and will replace all others to help you bring in even more big money wins! Don’t forget that there are a few other symbols to help you in your quest for delicious, delicious money, including pomegranates, oranges, and BARS. So spin these reels for a chance to bring in plenty more than just fruit salad! The bowl of fruit salad is a substitute and will replace all other symbols to help you bring in more wins. It also holds the top payout if you can spin three of them across the payline.